Two fine homes have already been completed in Laurelhurst, the new home addition on the East Side which has been on the market but a few months. In this handsome residence addition, homes are now springing up on every side but it is P.S. Easterday, president of the Columbia Bridge Company, and W.N. Everett, a contractor, who have finished the first homes in the great new addition which promises to be one of the most thickly settled of the better class of home additions in Portland. The home of Mr. Easterday, which has just been completed, faces the northwest on Royal Court. It is a handsome 10-room house, built at a cost of $10,000, and will be occupied within the next few days. 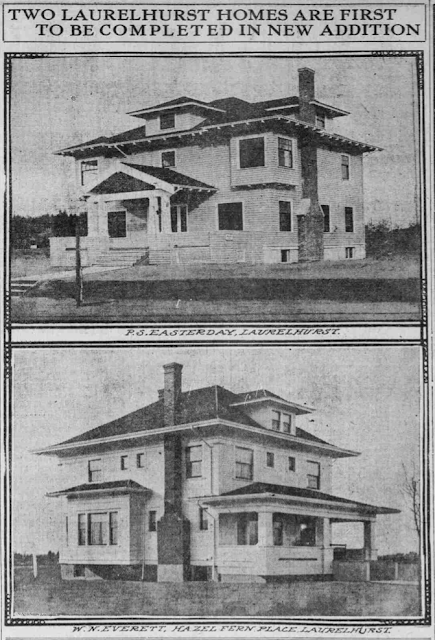 The Everett home is located on Hazel Fern Place, facing east, and while built as a home for Mr. Everett, is but one of four houses which he is erecting in the new addition. This home was built at a cost of $4500. These are but two homes now completed in Laurelhurst but within the next few months there will be a large number of costly residences in the addition. Charles K. Henry is having plans prepared for a $15,000 home on Laurelhurst Avenue and Dr. Homer I. Keeney will start in the immediate future to build a $7000 home on this same avenue. Among other residences planned to be erected this Summer are those for Francis Dubois Jr., to cost $5000; W.S. Hurst, a $5000 home; A.E. Kern, $5000; Grant Foster, between $4000 and $5000; H.C. Gresel, $5000; Charles V. Cooper, $10,000; C.S. Russell, $7000; and O.W. Taylor, $10,000.